Over the years we have covered many of Thrustmaster’s products which often have to do with racing and flight games. Nonetheless, several years ago the brand started dabbling with the headset market as well, and truth be told, we loved every headset they provided us with so far, ranging from fairly simple models to the more splendid limited edition designs which often had something to do with a big release in the gaming world. That being said, Thrustmaster clinged to one design for their headsets, only altering certain details, making sure their existing models would be updated enough for the next generation(s). Of course, this held the company back, as people would think the newer models were identical to the older ones, even with their performance up-to-date, with better drivers, surround sound and so on. 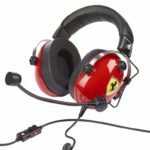 Now, Thrustmaster is trying something new with their T.Racing Scuderia Ferrarri Edition and T.Flight U.S. Air Force Edition headsets. While we love donning the pilot seat in a F-16, this time we kept our feet on the ground, with our seatbelt locked in, getting ready with the T.Racing model. Our reviews of the Y model headsets were becoming quite monotonous as most of the models had very similar designs, which wasn’t necessarily a bad thing, there was just nothing ‘new’ to tell design wise. 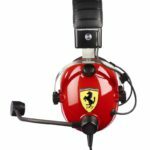 This time we get a totally different design with the flashy red T.Racing Scuderia Ferrarri Edition, which resembles an old school pilot helm, much like the ones used at the pit stop of a F1 racing event. 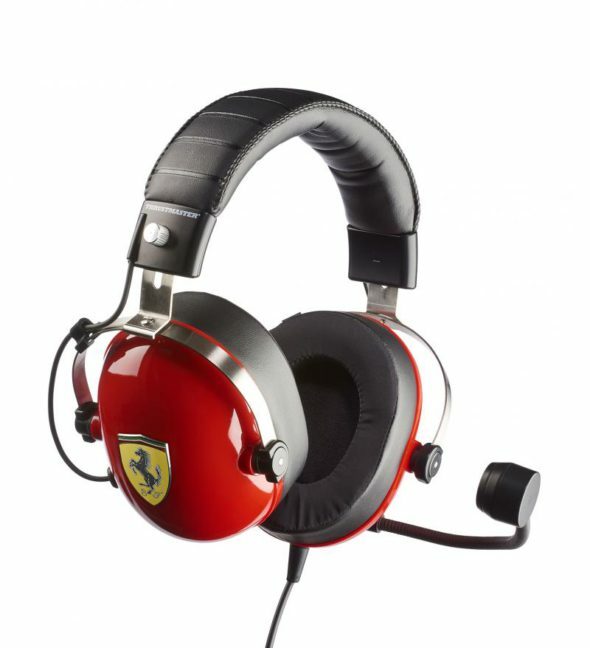 The Ferrari logo/shield is prominently featured on both ear pieces, which breaks the otherwise red plastic design. The headband is donned with a black leathery finish, just like the padding on the ear pieces, which have a leather outside, but a fabric inside, allowing air to flow through. Other notable design features are the large detachable mic, with a big head, and also the option to cover up the plug for the mic piece if you’re just in the mood to listen to some music or play your racing games on your own. You’ll also notice two iron ‘screws’ at the bottom of the headband, which are used to adjust the size of the headset. It’s clear that when designing this headset, comfort was an important aspect. The headband has enough padding to keep things comfortable and the ear pads are extremely soft on the ears. The exterior padding has been done with a leather finish, while the part that envelops your ears has been done with fabric, allowing air to flow through, preventing sweat to build up. The way to adjust the headband has been done in a fairly original way, but for some perhaps a bit tediously. You’ll see two screws on each side of the headband. When unscrewing said screw, you’ll be able to move the metallic piece in the headband to lengthen or shorten the span of your headset. When you find the proper size, you’ll have to tighten the screw again, in order to make sure the size remains the same. This mechanic has both a plus and a downside. It’s useful when the headset only has one user, making it so that the size remains the same, and you don’t have to adjust every time you’re starting your gaming session. On the other hand, when the headset is used by multiple people, it might be a bit tedious if both users have a different preferred size for their setup. The T.Racing headset works on pretty much every device with a 3.5mm plug, as that’s all you need to connect the device (audio only, except for PlayStation 4 and Xbox One). For PlayStation 4 and Xbox One usage, you’ll need to connect the headset to your controller and you’re pretty much good to go for your gaming sessions for both audio and microphone usage. If you want to use the headset fully on your PC, you’ll have to use the splitter extension, that divides audio and microphone to two separate plugs. With the device being plug-and-play ready, you won’t need additional software, as all the things you need are either incorporated on the cable’s control box and the volume regulator is on the left ear piece of the headset. You’ll notice that the headset doesn’t have any prominent features, outside of the mic volume settings, the ability to mute your microphone and the option to control your volume levels with the added regulator on the left ear piece. The headset doesn’t support 7.1 surround sound, as Thrustmaster was aiming for the needs of the racing and flight sim community, making sure they have reliable audio and therefore don’t really need the extra options 7.1 surround provides. While we can somewhat understand this approach, to reduce the price of the device, the current asking price might be a bit steep with the lack of said surround sound options. Nonetheless, the sound is crystal clear, the comfort features of the headset prove to be qualitative and the design is appealing, so we reckon that some of the production costs went to design and comfort. 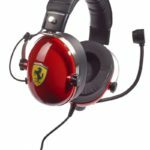 Thrustmaster’s T.Racing Scuderia Ferrari Edition headset might just be one of the best looking headsets we have seen over the years. The device proves to be very comfortable and it also has a decent audio input and the multi-platform features come in handy as well. Sadly, there’s one downside to the otherwise perfect picture. If you’re looking for a headset that’s for more than just racing and flight sims, the lack of 7.1 surround sound will surely be missed when playing other games, and if you add that up with the somewhat steep asking price, you’ll have to consider where your priorities lie.